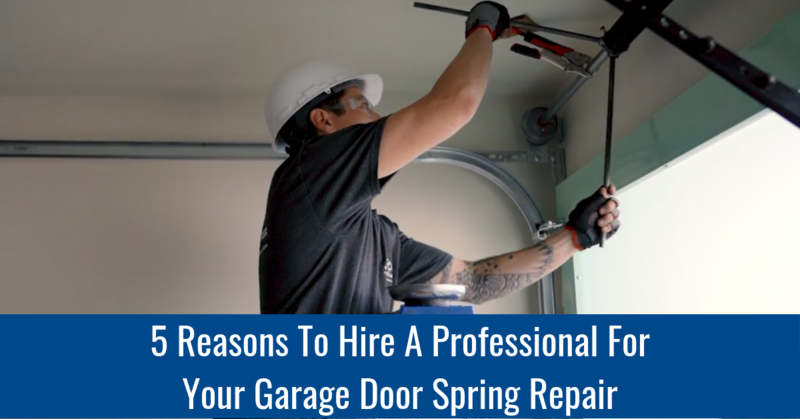 The most important thing to remember when addressing your garage door spring repair is that you SHOULD NOT attempt to fix it yourself! Here are five reasons why you should hire a professional. Safety: Garage doors can weigh as much as 500 pounds, and as you can imagine, a garage spring is under extreme tension if it is malfunctioning. This can pose a severe risk of injury if the door is to suddenly fall. Equipment: Even if you’re particularly handy around the house, the most common dangers occur when attempting to repair/replace a spring yourself. Torsion springs carry mechanical energy to help open/close the door and require specific tools to be handled with care and precision. By contacting a certified technician, you can relax knowing no personal injuries or damage will occur to you or your property. Skills & Expertise: Every garage door is different and requires expert knowledge of how the mechanics work. This is no common knowledge which is why our incredible team of technicians are certified on how to diagnose problems and handle repairs ensuring you don’t become part of those annual injury statistics. Timeliness: Hiring a professional is well worth it, because it will reduce stress and save you both time and energy. Our team will have the job done quickly and correctly, ensuring you and your family will have your garage door working again in no time. Prevention: The average garage door torsion spring lasts 5-7 years or 10,000 uses. When our team manages a spring repair, you’ll enjoy peace of mind knowing we use top quality springs to ensure the longest durability possible. Your garage is one of the largest and most important tools in your home, so make sure to contact a trusted repair expert like Easy Lift Door Company for your garage door spring repair.